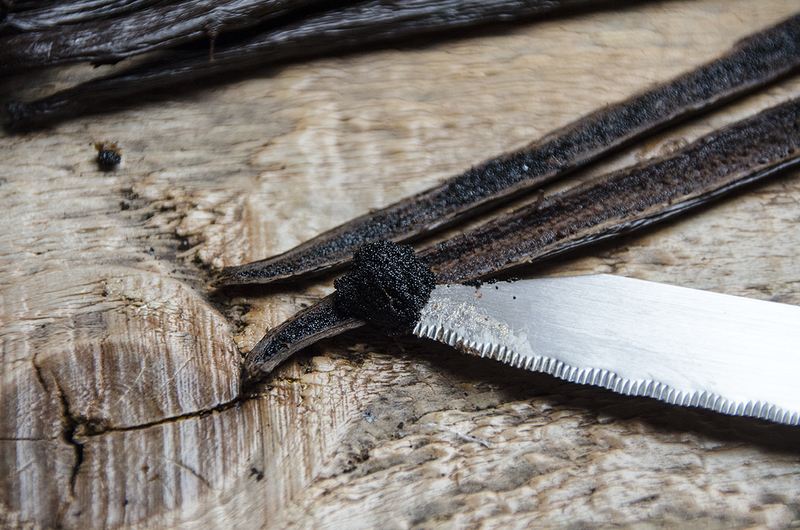 Everything you need to know about Vanilla> How to use your Vanilla beans ? Home > Everything you need to know about Vanilla> How to use your Vanilla beans ? "What's the best way to use my Vanilla beans?" is the most frequent question I get. Here are a few tips to help you figure out how you want to use it. Some like to blend or grind their vanilla beans before mixing it with sugar. As a result, you get a great cooking base. Others prefer creating homemade vanilla extract. It can be either intense and non-alcoholic (vanilla syrup) or more "masculine" and alcohol-based (rum). Purists will choose to cut the bean lengthwise and scrape the seeds loose from the bean. To fully enjoy all of the aroma and taste, be sure to add both seeds and empty bean to your preparation. You'll have to remember to take it out before serving or baking it though. Keep in mind that beans are almost as flavourful as seeds. Not many people know that, but you can use your vanilla bean more than once. Once used, dry the empty bean, grind it and add it to sugar and you'll get homemade, healthier and cheaper vanilla sugar. Should I use more vanilla beans to get more flavour? Absolutely not. A bigger quantity won't make up for better quality. Infusing half a vanilla bean for 1 hour on a low heat with a bit of sugar will work wonders. How can I enjoy the whole aromatic range of my vanilla bean? This is the tip I usually give my pastry chef friends. You'd better be prepared to be blown away! Choosing the right bean for the right recipe is crucial. This is why I give tips on all my products on their dedicated pages alongside their history, my relationship with the variety and their origin. Choosing my Vanilla beans is choosing quality and uniqueness. I travel around all the world each year to meet each and every one of my producers during the harvest. That way, I can discover new products, new varieties and take part in harvesting.